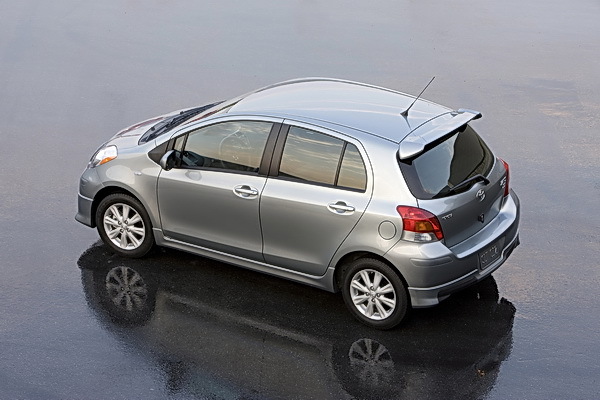 Honda Fit, Toyota Yaris and Nissan Versa Comparison – The New Big 3's Little 3. Whether or not you’ve grown up as a car buff, unless you’re a troglodyte who still walks barefoot from point A to point B, you’re probably familiar with who “The Big 3″ automakers comprise. And if you’ve watched any of the executive groveling before our esteemed panel of D.C. dunderheads we call our “leaders”, then you’re absolutely familiar with The Big 3. However in the aftermath of Toyota’s recent ascension past GM to become the number #1 selling automotive brand in the world – in addition to its involvement in NASCAR and multiple American manufacturing plants – the old Big 3 moniker may need revision to include Toyota. And who would be “The Other 2″? Honda and Nissan seem to fit the role quite well, with similarly expanding market share and multiple U.S.-based factories. Yes, it seems that when people nowadays refer to “The Big 3″, there needs to be some level of clarification – New School or Old School? One of the central reasons why “The New Big 3″ are worthy of this author’s self-appointed title is partly because of their historical focus on offering consumers economy, value, efficiency and practicality; something traditional Detroit automakers lost sight of in the last decade. But this article is not a rant on Detroit – Twain knows the topic is already about as moth-eaten as they come, and Detroit has seen the folly of their ways. Rather, this article is about comparing three little sub-compact cars: the Honda Fit, Nissan Versa and the Toyota Yaris. Cars that have held true to the decades-old focus and vision of The New Big 3 to deliver consumers an entry-level product that’s economical, practical, reliable and safe – well, relatively speaking. Safer than walking on the shoulder of an interstate, anyway. The Yaris is widely known as the Corolla’s smaller brother, which is like discovering that Danny Devito actually has a shorter sibling. Although the Yaris is short on size and weight – it’s the shortest five door hatch in this comparison by 11 inches and comes in at a cross-wind swooning 2300 pounds – the Yaris offers a fair amount of car for its $14K base price. Not to mention the fact that you can fit this car in parking spaces that the Fit and Versa would have to guillotine both bumpers for. 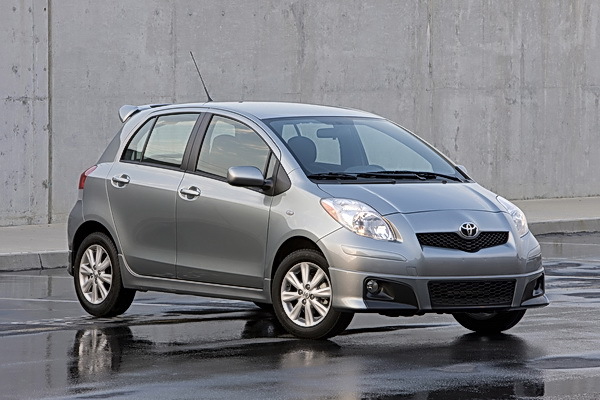 New for 2009 is the Yaris 5-door hatchback, which is based on the quirky and popular Scion xD, but Yaris only comes with a 1.5 liter DOHC four-cylinder VVT-i engine that eeks out 106 horsepower and 103 lb. ft of torque. Although these are the smallest power numbers of the three, Yaris has to move the least amount of weight, which actually makes the Yaris not as God-awful slow as you might imagine. It runs the 0-60 in the quickest time, an impressive 8.5 seconds, and still manages to get 29 mpg in the city and 36 on the freeway. But if you’re planning to hit that 8.5 second mark, you’re not going to do it with the slothful four-speed automatic, which is equivalent to attaching a boat anchor to the back. Road manners for the Yaris are passable, but just barely. The Yaris doesn’t mask the fact that you’re driving a graduated tin can with an engine that barely registers triple digits in the power department. And like many other modern Toyota products, the steering is slow, dead and disconnected. Just because you’ve become the biggest selling brand in the world doesn’t mean you automatically make cars that are fun to drive. Actually, I can’t think of one new Toyota that’s fun to drive anymore, which didn’t used to be the case, but I digress. Value-wise, the Yaris is just okay. For a $14K base price, you only get A/C and a tilt wheel. Items like power door locks and windows – which come standard on the less expensive, bigger, and more powerful Versa – are tack-on options with the Yaris. But of course, what you don’t get in features you do get in bona-fide, run-it-till-kingdom-come Toyota reliability. Safety-wise, the Yaris is also just okay, and in this comparison, finishes last in safety with only a 3-star NHTSA ranking for side impact. So for those who hate taking risks and are willing to sacrifice a little safety for the ‘the sure thing’ reliability of Toyota, the Yaris might be a wise decision. Exterior design-wise, 2009 marks some some styling retouches for the Yaris, which really help its appearance, especially in the sportier “S” model. Particularly with the hatchback, from the outside, the Yaris is a sharp-looking machine. 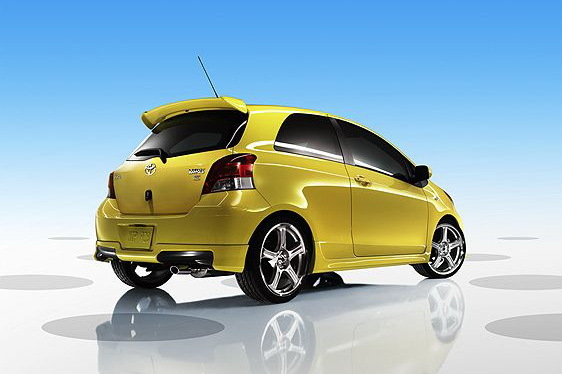 However, once you open the door and cross the threshold, matters unravel quickly for the Yaris. 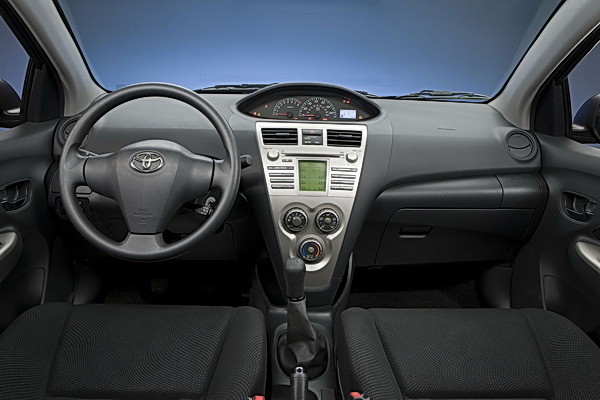 On the inside, the Yaris does a lot with what little room it has. 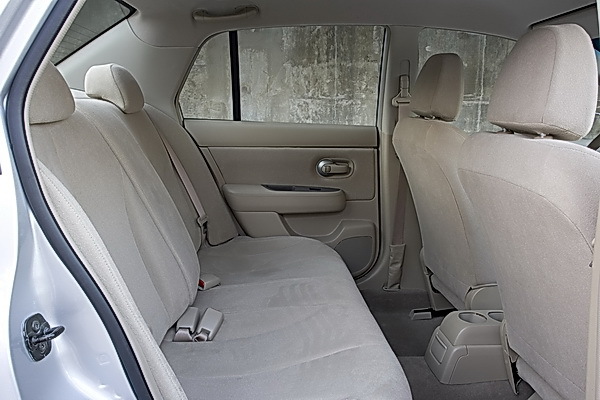 With rear seats down, the Yaris offers an adequate 25.7 cu. ft. of cargo space. Not bad for a car of this size, but when lined up next to the Versa and Fit, falls well short. However, for this author, the interior design of the Yaris is without question the biggest deal breaker. 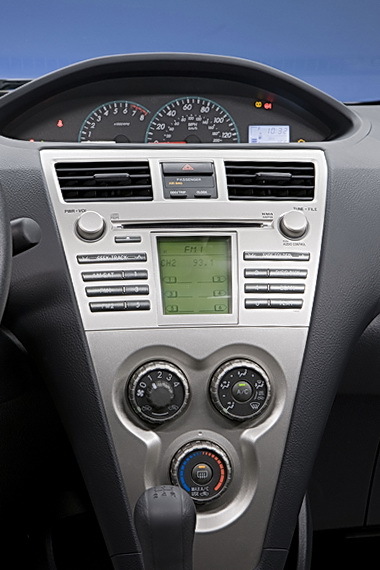 Why Toyota continually insists on its entry-level cars having the gauge cluster in the dead center of the dash is a mystery almost as great as why Chrysler manufactures so many redundant, useless heaps of vehicular waste. Having nothing but bare dashboard in front of the steering wheel is like looking at your favorite cartoon character with its eyes, nose and mouth missing. It just doesn’t look right. And the linear stack of HVAC controls doesn’t do anything to resolve the situation. Quite simply, the interior of the Yaris hurts it enough to earn last place in this Little 3 comparison. The Versa comes to this New Big 3 comparison technically classed as a midsize car, not a sub-compact. But by only looking at the Versa S base price of $13,800, you’d never guess it offers a 122 horsepower engine, A/C, cruise, CD stereo, and power windows and door locks, all standard. What’s more impressive is what Versa is offering for 2009 – a new base level Versa 1.6 which actually comes in below $10K at $9,990 (before destination charge)! This is a low enough price for the Versa to dethrone the Chevy Aveo as the least expensive car in America. Granted, the base Versa has a smaller, 106 horsepower engine, no A/C, cruise, power windows or radio for that matter, but hey, what do you expect for $9,990? So the Versa technically offers the most car for the least amount of money in this comparison, but is the quality of the Versa greater than its price? The answer is a resounding Yes. Based on our road test of the 2008 Versa S, we think that the Versa is without question one of the best values in all of autopia. Name another car that can deliver so many standard features, highest safety ratings, a 122 horsepower engine that gets up to 33 mpg, a six-speed manual transmission and rear seat legroom almost as spacious as a 5-series BMW at a sub-$15K price. Having trouble? That’s right. You can’t. 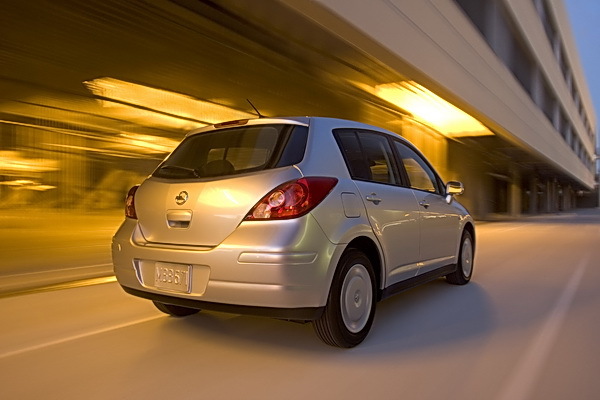 When it comes to outright value, the Versa stands alone. Then consider the new Versa 1.6 at below $10K, which, quality-wise, demoralizes the former low-buck title holder, Chevy Aveo, and the case for the Versa is overwhelming. So if the case for the Versa is so strong, what keeps it from being the overall winner of this comparison? It boils down to intangibles. The Versa comes out on top in many categories, but where it fails in comparison to the Fit is in the aesthetics department. 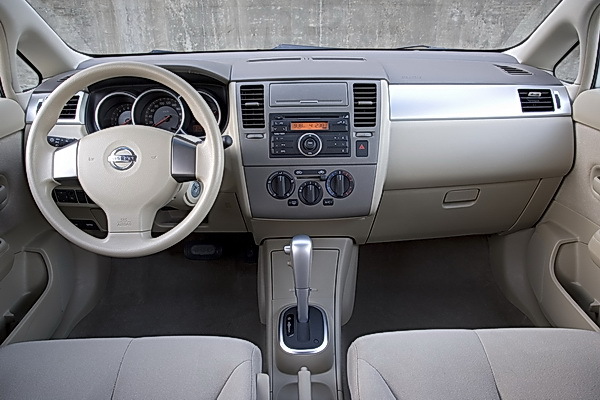 At the end of the day, the Versa is just “basic transportation” – something we touched on in both the written full review of the 2008 Versa and the Versa video review . The Versa lacks the sporting feel of the Fit, and although it’s technically got more power, it has to lug 200 more pounds around than the Fit, so acceleration is a wash.
There’s nothing wrong with “basic transportation”, but if you’re going to live with this car every day, wouldn’t you like a little more personality? I mean, think about it for a minute. Did you marry your spouse because he or she fit the parameters for “basic procreation”, or did you marry your spouse because he or she made you laugh and feel good about yourself? This is the elemental difference between the Versa and the Fit. first off, great article, love to see some input on my favorite segment of cars. my wife and I just purchased a 2010 Yaris off the lot last sept. and absolutely love it. its the 3 door liftback model with the sluggish automatic. I’m used to driving a Jeep Wrangler on 37′s so the Yaris does please me quite well on the acceleration. Throttle response is a bit sensitive upon launch but that may be the torque converter kicking in. We’ve both gotten used to glancing over at the oddly placed center dash gauges but it actually opens up the viewing area to pay more attention to the road and your surroundings. I love how simple the setup is and how easy it is to work on. I’ve already swaped heat units, added cruise control which IS supported native in the ECM. Air filter & Cabin filter are easy swap outs and oil changes are a breeze to do. 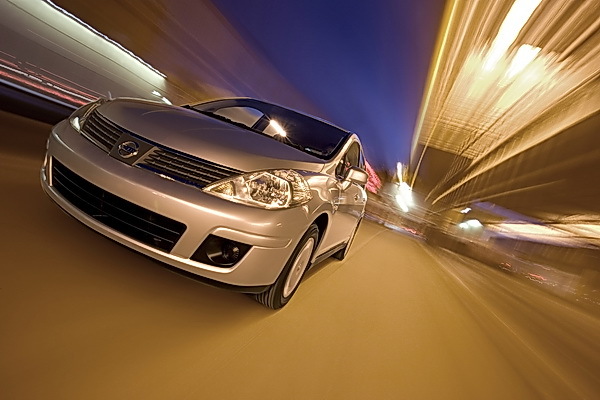 There is nothing complicated to go wrong like a clunky power steering system or automatic belt tensioners. there is enough space in the engine compartment to easily replace any item in the future should something go wrong, keeping labor hours down or making it easier for the DIY mechanic. we were lucky enough to find a certified pre-owned on lot with fully automatic locks, windows, and keyless entry added, HUGH bonus over the piece of junk focus we got rid of. I can see this car easily lasting to be our unborn childs first car. Thanks, Kurt. Your comparison of these 3 little ones have been very helpful to make an informed decision. I read your articles before and I found them clear and unbiased. Thanks, again. right on Kurt. tell it like it is. Nissan and Honda combined are about equal to Ford, and Honda alone has twice the production of Chrysler, so it’s a wash. And I’m not ‘promoting’ foreign cars. Have you read my reviews on the Flex and Malibu? I think they’re both among the best cars of 2008. Additionally, when a Toyota is built entirely within the United States, I consider it a domestic car, supporting American workers, helping the American economy. I love this country (most of the time) and always make sure I’m buying USA made AS LONG AS the products are of utmost quality and value. But I refuse to compromise and buy inferior, crapcan products just to support an inferior, crapcan company – American or otherwise. I think the Old Big 3 are realizing this, as evidenced by some of their terrific new models (Chrysler excluded). Thanks for reading, and for your honest feedback. nissan and honda together is not nearly as big as ford alone let alone GM, and Toyota only out sold GM in these tough times when many people wanting cars could not get credit and they outsold them by a very small margin. You live in America why would you promote foreign cars so much? For the past five years the imports have had more recalls than American made cars………………..